This wrap-around cloak protects its wearer from the elements. +2 Saves and checks vs severe weather. Two hours of breathable air. This large specialized tank is filled with the powerful healing agent Bacta which promotes rapid healing. 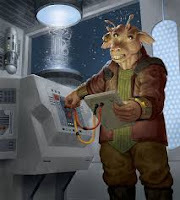 A Bacta Tank and a supply of Bacta is expensive, so much medical equipment is usually found only in hospitals, aboard Capital Ships, and within major military bases. Each hour of treatment consumes one liter of Bacta, which costs 100 credits. A typical Bacta Tank holds up to 300 liters of Bacta, and the Bacta Tank must hold at least 150 liters at all times to provide any benefit. Only one creature can be immersed in the tank at any given time. The bacta initially heals 1d8 hit points and then 1 hp per hour of immersion. Protect fully against toxins (chem and biological) and provides breathable atmosphere for one hour. Filter and atmosphere canister must be replaced after one hour. Binder Cuffs are Durasteel restraints designed to lock two limbs of a prisoner together, normally the wrists or ankles, but it is possible to lock one arm to one leg or use the Binder Cuffs to hook a prisoner to a tree. The cuffs have a Damage Reduction score of 10 and 20 hit points. Breaking them requires a Strength check with a 16 penalty. If the penalty brings the Str score to 0 or less there is no chance. Removing them without the seven-digit release code requires a Repair check with a 12 penalty. The Binder Cuffs can be attached to the limbs of any creature of Large, Medium, or Small size. Accesses secure data as a key. Each cylinder features the user's personal security clearance data. Standard handheld model with a range of 50k/low orbit. Range of 200 kilometers or high orbit. The unit is a backpack-sized Comset. For double the cost, a Long-Range Comlink can be miniaturized to a wrist-sized unit. Encryption: A Comlink can have hardwired encryption routines (Adding +4 penalty to Computer checks made to intercept your transmission) for ten times the base cost. Video Capability: A Comlink can have Video capability (Two-dimensional images in addition to Audio) for twice the base cost. 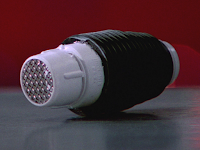 Holo Capability: A Comlink can have Holo capability (Three-dimensional images in addition to Audio) for five times the base cost. The Credit Chip is a small, flat card that features a security codeout and credit algorithm memory stripes. The chip can hold a specified number of credits appropriate to the government that issued it, or it can draw from a specific account held by the user. Credit Chips not only allow quick and easy transfers of funds, but also protect users from theft. Modifying a Credit Chip so that government and bank computers think that it draws on a different account or that it has a different value stored is almost impossible. The bank systems are fortresses. To do so involves a Computer check with a 20 penalty. Even worse, you won't know if your check succeeded until after you attempt to use the modified Credit Chip. If you fail, the government or bank computer orders the chip's Self-Destruct programming to activate, ruining the chip. If you fail by 5 or more, the chip's Self-Destruct programming activates, and the government or bank computer traces your location, dispatching security personnel to apprehend you. These handheld personal computers serve as notebooks, day planners, calculators, and sketchpads. In addition to performing basic computer functions, Datapads can interface with larger computer networks directly or via Comlink. The datacard is programmed with specific information giving the user a +2 on checks relevant to the information. This device magnifies distant objects in most lighting conditions out to 10 kilometers. An internal display provides data on range, relative and true azimuths, and elevation. Viewing options include zoom and wide-vision observation. Electrobinoculars also feature radiation sensors and a nightvision mode. A small flat battery that provides power to most devices an a few small weapons. 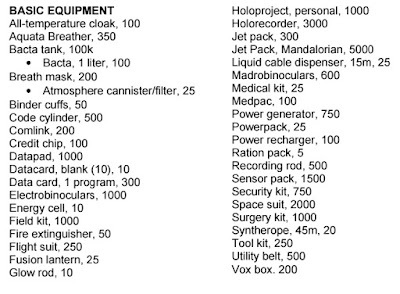 Essentially a backpack full of Survival Gear, the typical Field Kit contains two condensing canteens with built-in water purification systems, a sunshield roll, a week's worth of Ration Packs, two Glow Rods, two Breath Masks, 24 Filters, 12 Atmosphere Canisters, and an All-Temperature Cloak. If used for its intended purpose, the extinguisher can put out a fire of up to 10 squares in size, at a rate of two squares per round before it is depleted. A full round blast also provides cover in combat (-4 to hit) and spreads one square for each round it is blasted. The cloud disappates in three rounds. Replacement cartridges cost 25cr and takes one round to load. The Flight Suit is a one-piece coverall that provides life support, protects the wearer from hostile environments, and prevents the wearer from succumbing to the adverse effects of high-velocity flying. A Flight Suit and helmet provide up to 10 hours of life support. As long as you have life support remaining, you are immune to any hostile atmosphere or inhaled Poison hazard. The suit also grants a +1 to AC. A hand-held light source larger than a Glow Rod, the Fusion Lantern produces light and heat. The light spreads out from the lantern, producing illumination in a 9m radius. A Glow Rod is a portable illumination device that projects a beam of light up to 10m. A handheld, personal hologram transmitter can be used to view real-time or recorded three-dimensional images or to pass the information through a Comlink connection. This storage device has enough memory to store about 1 hour of a Holo recording, or 1000 Holo images. Handheld. Can store up to 200 hours of images and has ports for recording rod input for expanded memory. Move 100m per round. A fuel cell holds 20 rounds of fuel. It can be used for short bursts or sustained flight. If it runs out of fuel mid-flight the user falls on his initiative the next round. A flame projecting weapon can be hooked to the fuel cell. 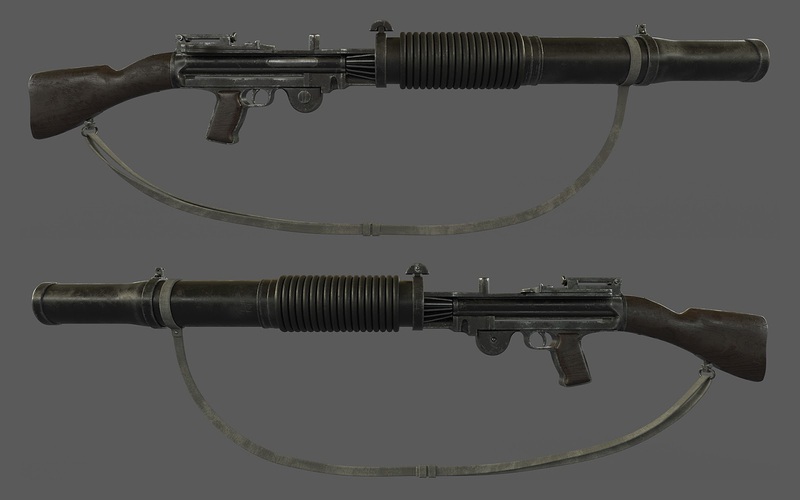 For every burst of fire from the flame weapon subtract a half round of fuel. If a user is down to a half round of fuel he may move up to 50m and try to get somewhere safe before he falls the next round. can lift up to 180 kg while flying. Replacement fuel cells cost 100 credits. 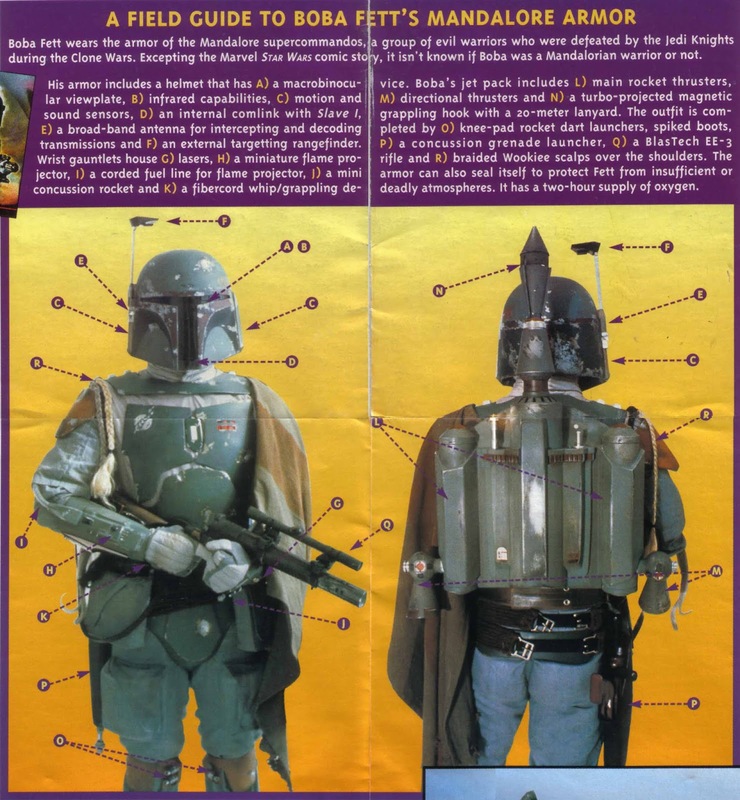 A Mandalorian Jet Pack functions identically to a standard Jet Pack, but has an integrated Missile Launcher (Treated as an Inaccurate weapon), and a magnetic grappling hook (Which functions as a Liquid Cable Dispenser). A Mandalorian Jet Pack is considered to be both Military, and Rare. View out to 1k. Basic info such as distance and elevation. More powerful models could view longer distances, even into low orbit. This backpack-sized Medical Kit includes almost everything a first responder needs to save a life: diagnostic scanners, anti-venom, medicine to counteract the effects of contaminated water and Radiation poisoning, burn treatments, defibrillators, respirators, shock blankets, pressure cuffs, a collapsible repulsorlift stretcher for patient transport (Capable of hovering with 160 kg load), and even limited surgical tools. 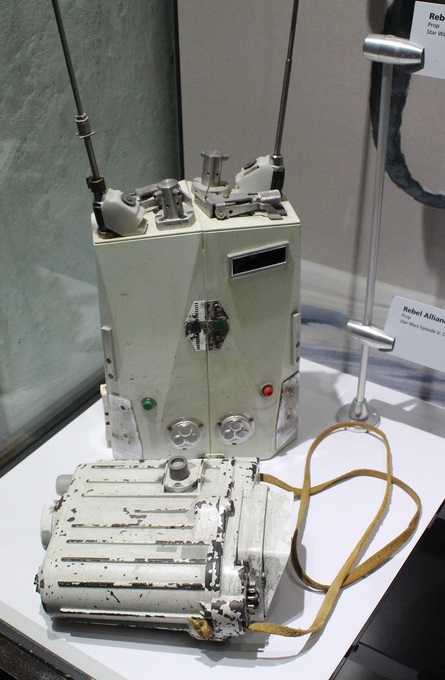 In addition, a Medical Kit has six external pouches for carrying expendable medical supplies, such as Medpacs. Gives a +4 bonus to medical checks. Medpacs are compact packages designed to both equip and trained medic for work in the field and allow untrained individuals to apply first aid in emergencies. A Medpac contains bandages, Bacta, synthetic flesh, coagulants, stimulants, and other medicines designed to help an injured patient recover quickly. Heals 1d6 hit points. A maximum of 3 can be used on one person per day. Once you use a Medpac, its contents are expended. A Power Generator is a small fusion reactor that provides continuous power for Heavy Weapons, Vehicles, structures, and machinery. It can power anything up to a Gargantuan Vehicle or structure indefinitely, a Colossal Vehicle or structure for 1 day, and a Vehicle or structure of Colossal (Frigate) size for 1 hour. After that, it is Disabled and must be replaced. If a Power Generator is destroyed while in use, its fusion reactor overloads and explodes, venting plasma into the surrounding area. When a fusion reactor explodes every target within 6m must make a Saving throw or suffer 8d6 points of energy damage. If the Save is made the target takes half damage. 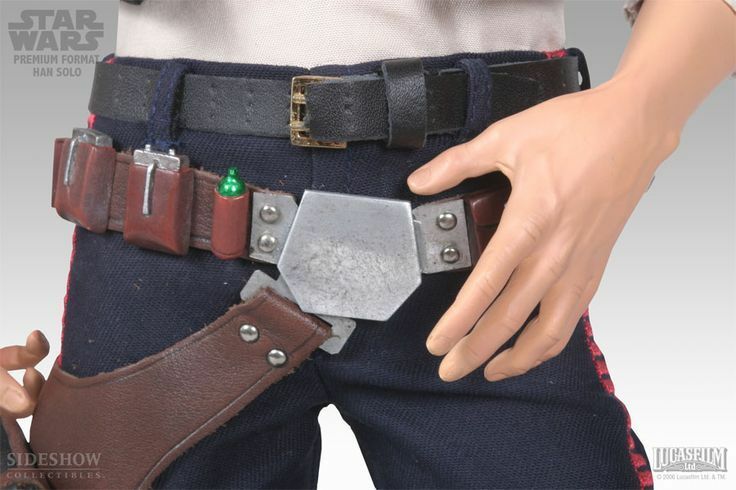 A Power Pack is a compact rectangular battery that fits into the grip or barrel of an energy weapon, such as a blaster, to provide the power needed to fire it. A Power Pack can be recharged with a Power Recharger. A Power Recharger is used to recharge a Power Pack or Energy Cell. The recharge process takes 4 hours, and only one Power Pack or Energy Cell may be recharged at a time. A Power Recharger holds enough power to recharge 100 Power Packs or Energy Cells, but is normally connected to a ship's or building's power supply, allowing it unlimited recharge capacity. Ration Packs are compact meals that take up little room (You can fit six in a pouch designed to carry a Datapad), but have all the requirements to nourish a person for one day. Each Ration Pack is geared for a range of Species. The food isn't appetizing, and it doesn't include water, but it does prevent malnutrition. Long, clear cylindrical tubes that recorded and played audio and visual images. The data was stored in chips or storage crystals and the recording material played in two-dimensions on the exterior of the rod. The controls were located on the ends of the rod. A portable scanning device, the Sensor Pack is a bulky rectangle featuring a variety of dials and switches, a readout display, and a scanning dish. 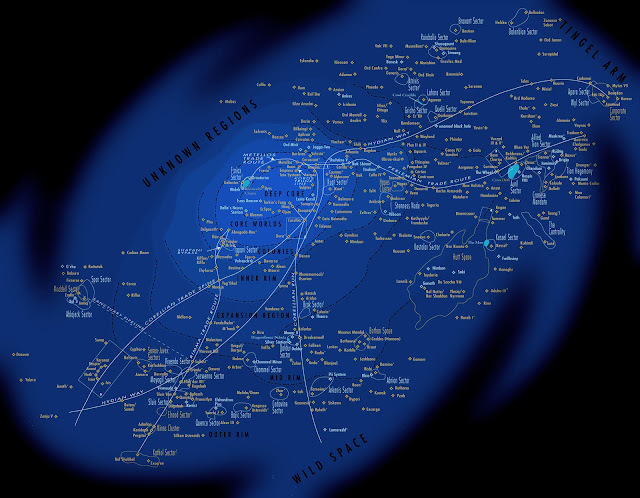 It provides general details on comm signals, life forms, and hazards within 1 kilometer. Operating a Sensor Pack requires a full round and grants a +8 to Wisdom/Search until the end of your next round. A Security Kit is a set of special tools for bypassing electronic and mechanical locks. It usually includes electronic components and dedicated sensor devices. On most worlds, possession of a Security Kit is illegal for anyone who doesn't have the proper permits, such as members of law enforcement agencies and professional security experts. A Security Kit is required to bypass traps or security systems using the Computer skill. A Security Kit contains a Comlink that monitors frequencies typically used by silent alarms, so the user can know if such an alarm has been triggered at any point during the operation. This bulky coverall contains a sealed life support system that provides everything the wearer needs to survive for 24 hours in the vacuum of space or any other hostile environment. As long as you have life support remaining, you are immune to any atmosphere or inhaled Poison hazard. The suit also grants a +2 to AC. This small kit contains the instruments a character needs to perform surgery on a wounded character. You need a Tool Kit to reprogram a Droid, or to Repair a damaged Droid or Vehicle. A Tool Kit also makes repairing devices much simpler. The standard Tool Kit represents a broad collection of tools designed to take apart, analyze, modify, and rebuild almost any technological device. 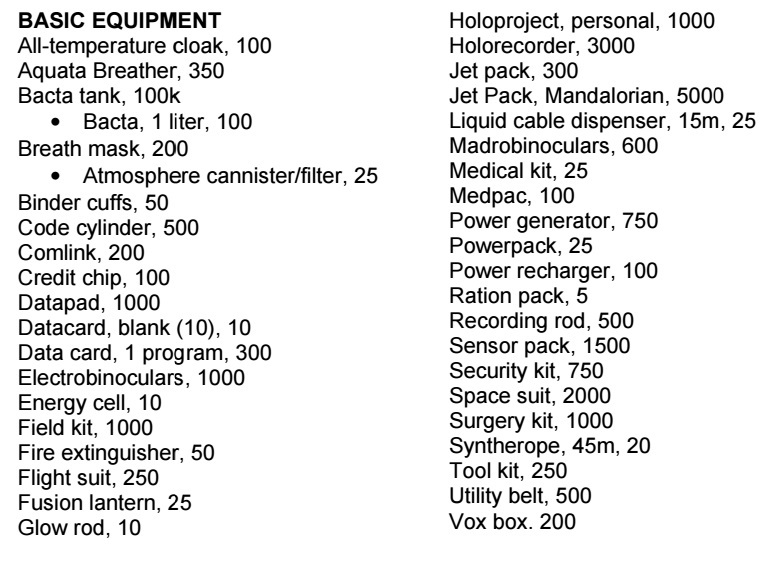 Most technicians personalize their Tool Kits over the course of years, but almost all contain the tools in the below table. 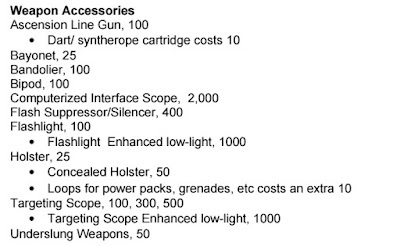 A Utility Belt has 10 pouches containing a standard array of items. Each pouch can carry 0.5 kg. A Vox-Box is a simple audio playback unit with 12 reprogrammed phrases in Basic ("Yes." "No." "Go Away." "How much?" "Please take me to someone with authority." "I understand." "I need assistance." "I can help you." "I mean no harm." "I am hungry." etc), each with its own button. 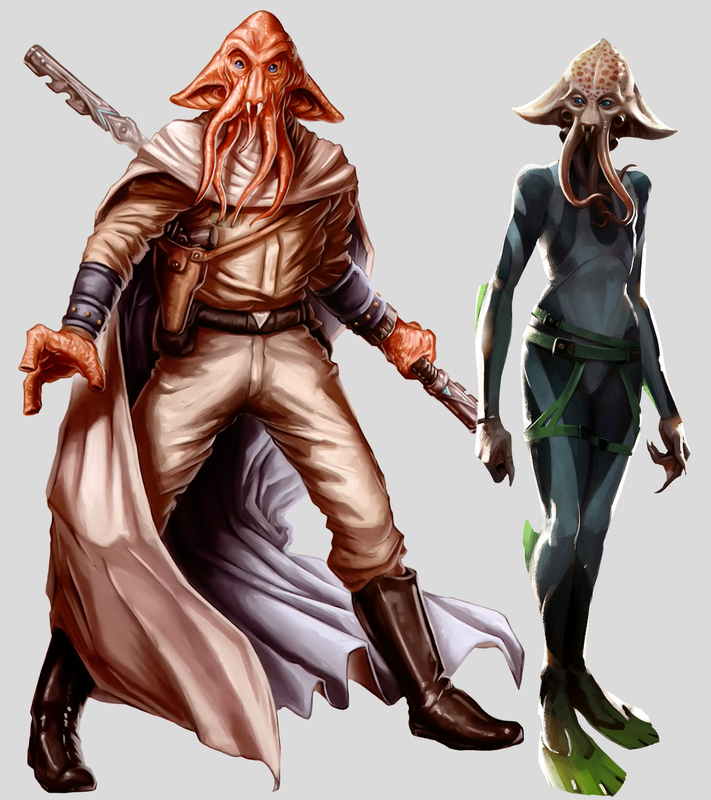 These devices are useful to races that understand Basic but can't speak it (Such as Gamorreans and Wookiees). Devices that speak these phrases in other Languages also exist. Altering one or more of the Vox-Box's pre-programmed phrases requires a Computer check. with a -4 penalty. 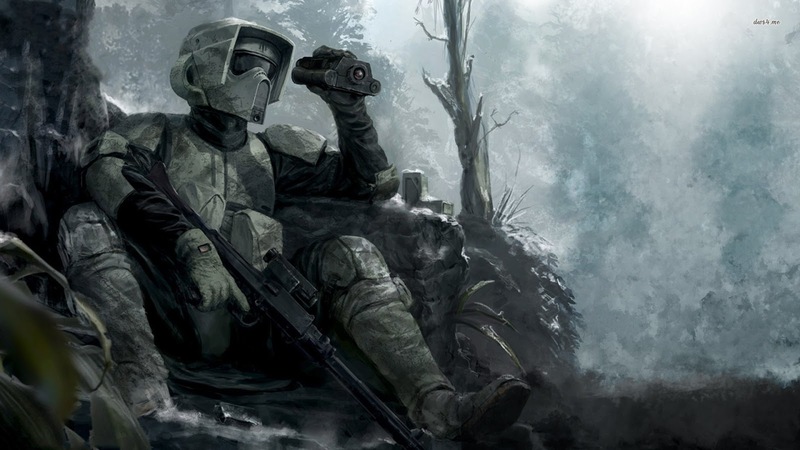 Rebels and smugglers tend to go for the light inexpensive and inconspicuous armor such as blast vests and combat jumpsuits. Bounty hunters and front-line troopers tend towards the medium to heavy armors and can add a number of useful modifications and add-ons for their work. 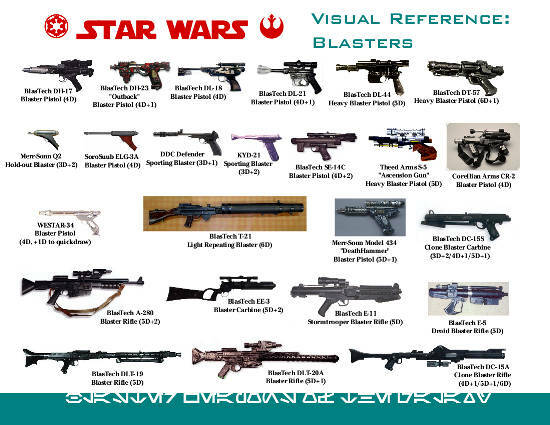 I've included firearms/blaster ranged combat rule mods that I use. Found below the weapon table. Most of it is pretty self explanatory, same old D&D: roll d20 to hit AC. Ta da. Normal combat initiative is 1d6 + Dex bonus. A character can draw a weapon and use it in the same round but with a penalty of -3 to the initiative roll and a -2 to the attack roll. 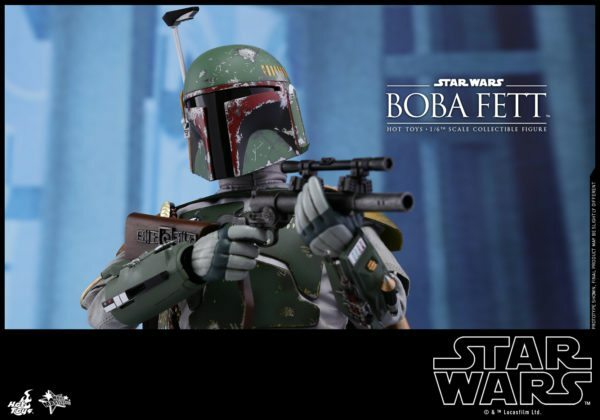 This can be further modified by character ability such as the Bounty Hunter and Smuggler fast draw ability and equipment bonuses or penalties . 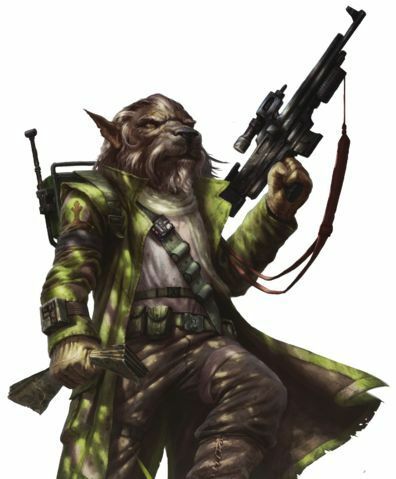 A 5th level Scoundrel has a +1 Dex bonus and a +2 Fast Draw bonus for a total of +3 to his fast draw initiative . Pulling a blaster pistol he rolls a 5 on his initiative -3 for pulling a weapon in the same round +3 for bonuses for a total of 5 on initiative. 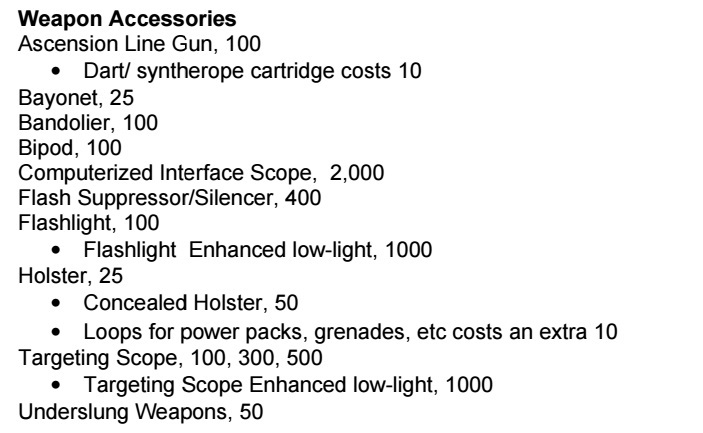 These bonuses/penalties only apply when Drawing a weapon, not normal initiative. Firearms have ten range increments, and suffer a –2 penalty per increment after the first. Within 10' of a target (5' for derringers) the shooter gains a +4 bonus to hit. Take a round, gain a +2 bonus to one shot. The attacker can do this for two rounds (no more) for a +4 bonus to hit. Anyone can make one attack per round with no penalty. The basic careful shot. 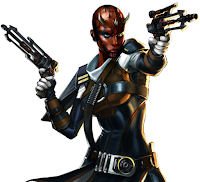 Characters who have follow through as a class ability can use it with Multi and Auto fire for an extra attack or two. Use the first shot to determine if a follow through occurs. If it does then the extra attack(s) are immediately taken followed by the rest of the normal Multi or Auto attack. If used with a standard one attack no penalties are incurred. All penalties from Multi or Auto-fire are incurred by the follow through(s). 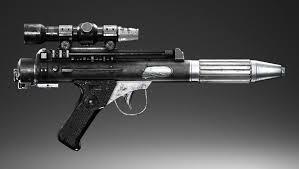 The attacker can take two shots per round with a –2 per shot. The attacker can make three attacks per round with a -2 penalty per shot. May attack two targets with one attack if they are within 2m of each other. 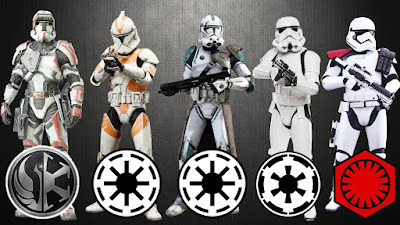 Each attack uses 2 units of ammunition if using a blaster pack, bullets, etc, full burst of three shots would use 6 units of ammo. 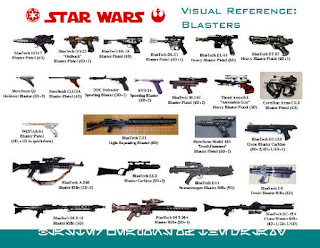 Blasters and slug throwers which require a magazine take one round to reload and ready. 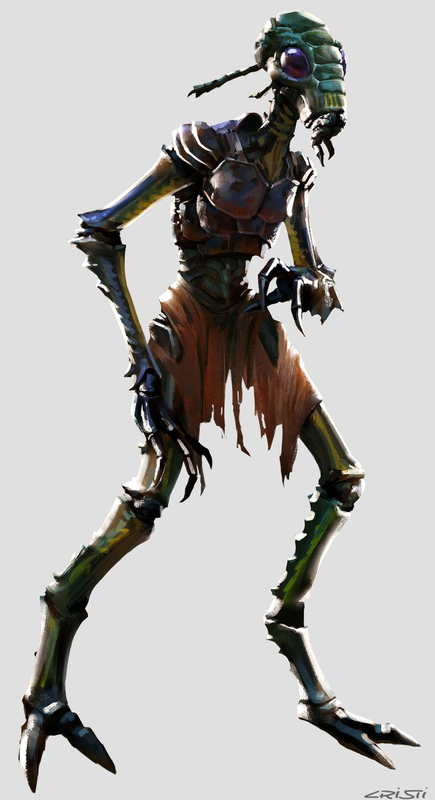 With slug throwers a desperate shooter can hurry the reload and attack with a –2 penalty to his attacks that round. Switching to stun mode (if available) is a free action. If a target is hit with a stun shot he must make a Constitution check. If failed he is incapacitated for 1d6+6 rounds. If the Con check is made all actions are at a -2 penalty. This is cumulative with more shots. This penalty lasts for 1d6 - Con bonus in rounds and is cumulative with each additional stun shot and Con check. The cumulative penalties are in effect until all of the cumulative time is run out. He does not drop from -6 to -4 to -2 to 0 penalties. All are in effect fully until the penalty time runs out. A Wookie is hit with two stun shots in a round and makes his Con checks. He has a total of -4 penalties to all rolls and the length of time is determined to be 5 rounds after rolls and bonuses are taken into account. Two rounds later he has 3 rounds of penalties left but he is shot again and makes his Con check. His penalty total is now -6 and the length of time is extended by 2 for a new total of 5 rounds. 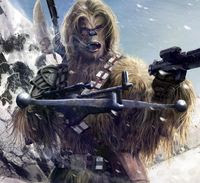 The Wookie must escape or kill his attackers or he will eventually fail his Con checks with the penalties as they keep piling on. 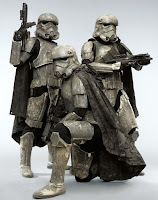 Ion damage only affects Droids and electrical devices/entities. 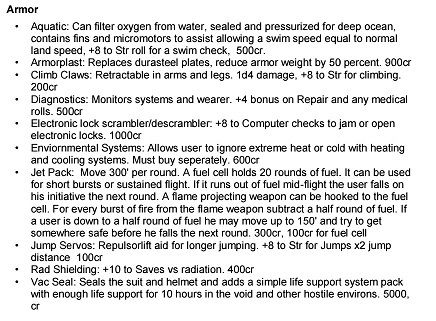 Ion weapons inflict the listed damage and stuns the Droid/device for 1d6 hours. A Saving throw is allowed to cut the damage and stun time in half. -2 penalty primary hand, -4 off hand. You can use the multiple attack options with this. 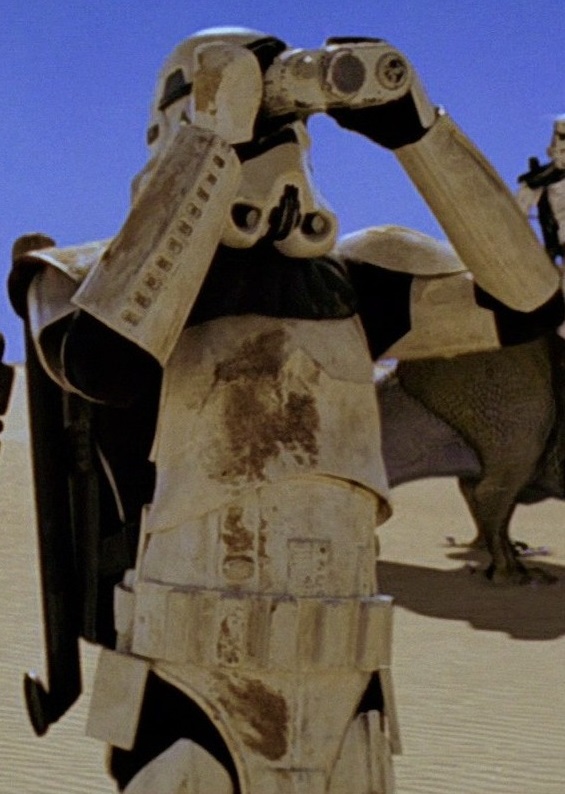 Example: firing two Multi-shot blasters twice. 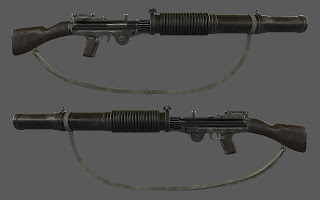 -2 for each shot is added to the Two Weapon penalties for a total of -4 primary/-6 secondary with a total of four shots. 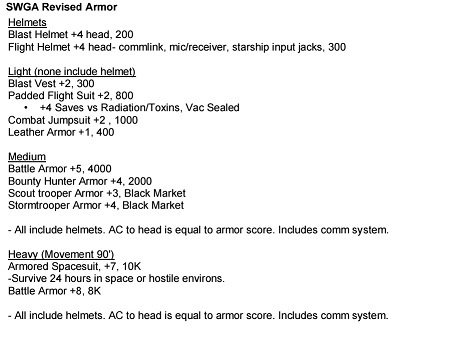 Lightsabers ignore all personal armor and up to 10 points of DR on vehicles and starships. 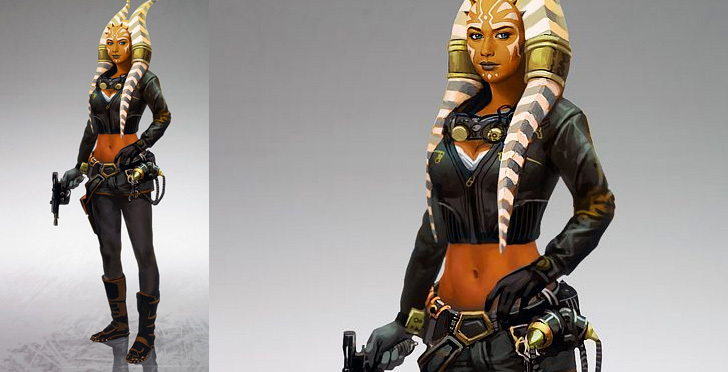 Some materials such as cortosis and mandalorian iron can resist lightsabers but are rare and expensive. 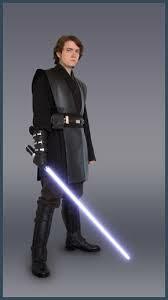 Force pikes and electro-staffs were also able to withstand a lightsaber. Star Wars for Classic D&D/OSR Rules. It is my version of what I want Star Wars to be. It is what I run Star Wars games with for my friends. It is partially based on Star Wars Galactic Adventures found HERE. I've also dipped my toes into Star Wars with White Star here and here and here. I enjoyed SWGA immensely. It is a fun, easy system that really does play and feel like a classic era RPG from the late seventies and early eighties. The second edition even more so as it made subtle changes such as rolling hit dice instead of static hit points from the first edition. The combat system is similar to classic D&D but a bit different with a nice chart and simple math. It also has some really nice bits such as the Force powers. ⦁ A completely classic D&D compatible game. 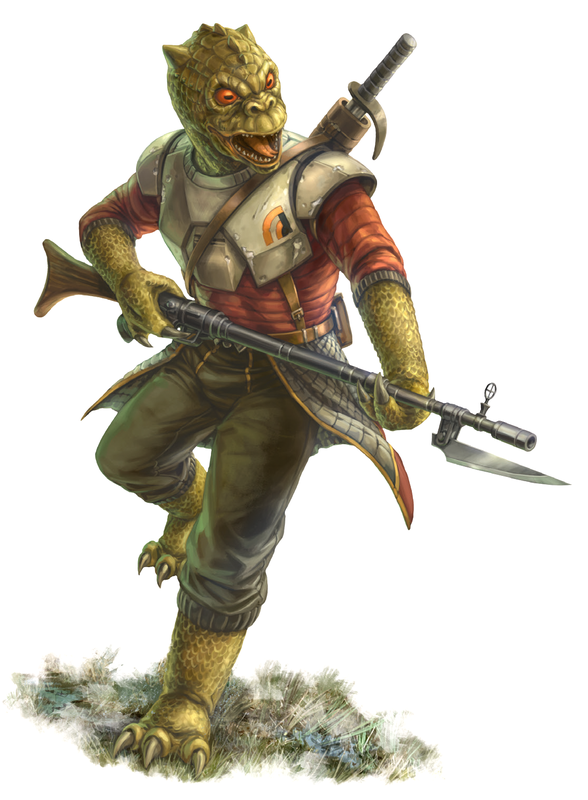 I want to use the framework of classic D&D with the additions of Star Wars races, classes, tech, and added rules for blaster fights and vehicle/ship combat. ⦁ I wanted more options for players. I and my players would rather use ascending AC and add a hit bonus. ⦁ I wanted expanded classes with more abilities. 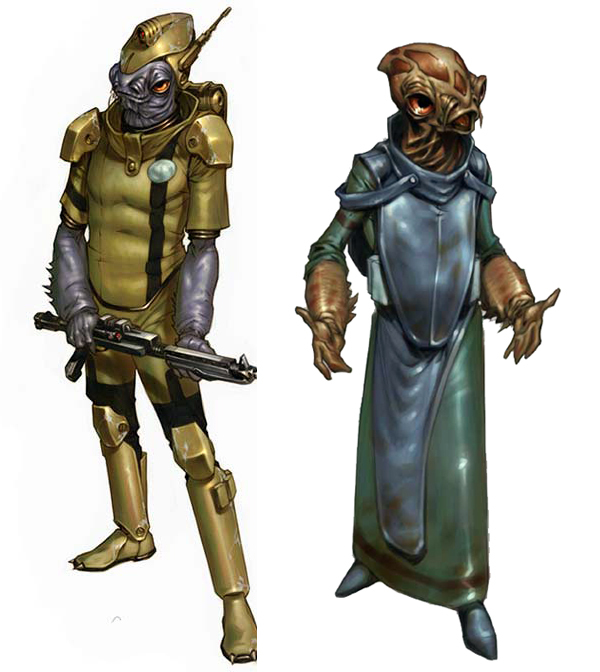 I wanted the same with playable alien races. I wanted a simple 'skill' system based on attribute rolls with bonuses and penalties. The rules for vehicles and starships in SWGA are super slim as to be almost non-existent and I wanted a bit more crunch but not pages of it. 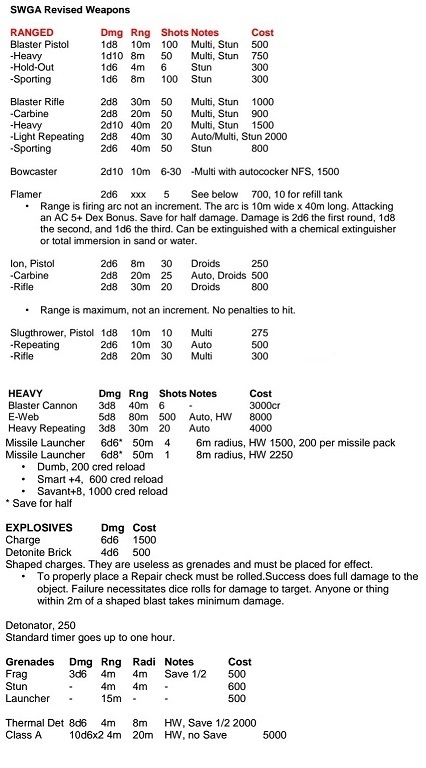 My solution was to borrow from the D20 Star Wars and Saga material for vehicle and ship stats as well as basic situational rules for travel and combat without relying on a ton of charts and maneuvers. So I stripped it down to basics on stats and vehicle/starship travel and actions. Combat is now a simple initiative roll and an opposed Piloting (Dex) check with modifiers for situation and ship maneuverability between pilots; best roll wins a maneuver, attack, and AC bonus as they out fly the other ship. More on this in another post. Our first space combat went very well. 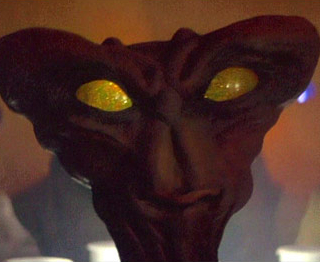 The races are taken from the d20 alien source-books. The attribute mods are mostly taken straight from the source-books and the special abilities slightly modified to fit into my attribute 'skill' system and a few extras such as the occasional natural attack were added. Use your judgement and don't sweat it. Many sources clash with each other. Use what you like. Salt Addiction: if salt is consumed the Arcona must make a Saving Throw at a -6 penalty or become addicted. An addict must consume 25 grams of salt daily or suffer a -2 to all rolls. Sharp Eyed: -1 to be surprised. 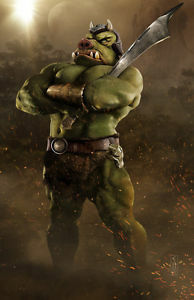 Language Restriction: Can understand other languages but only vocalize Gamorrean. Mood Detection: with a Wisdom check the Gotal can read the mood of all creatures within a 30' radius. +2 when tracking living beings or droid whose energy signature they have encountered before. 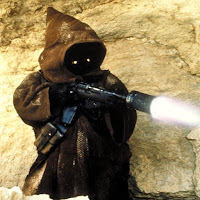 Language Restriction: Can understand other languages but only vocalize Jawa. +2 to Wis/Search with vision based checks/ +4 if target within 20'. 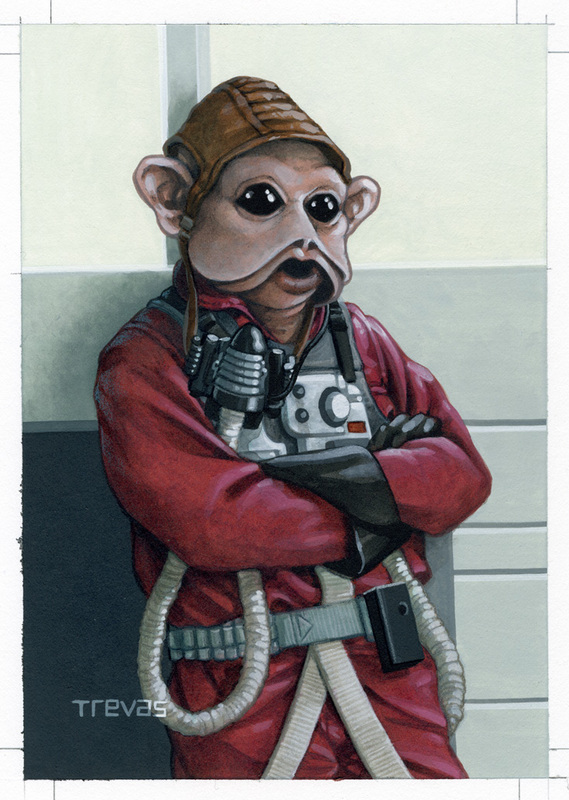 Language Restriction: Can understand other languages but only vocalize Shyriiwook the Wookie language. The Classes are inspired from SWGA but I expanded the number of abilities in most and added the option of multi-classing without punishing the player's hit bonus and saving throws. 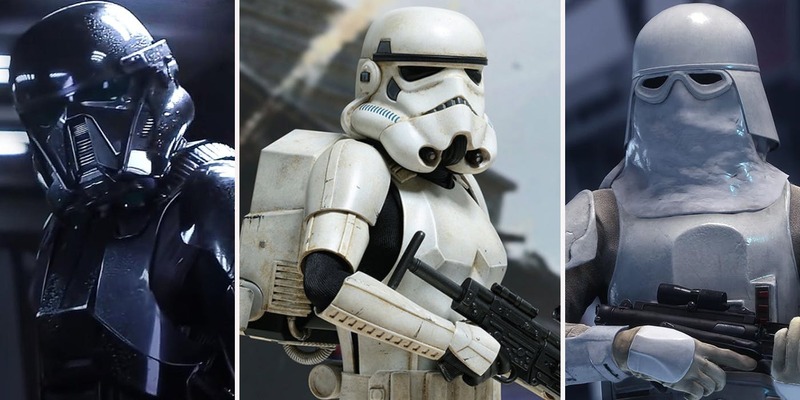 Named characters in the Star Wars films and other media are usually competent and talented at many things, multi-class helps to reflect this. 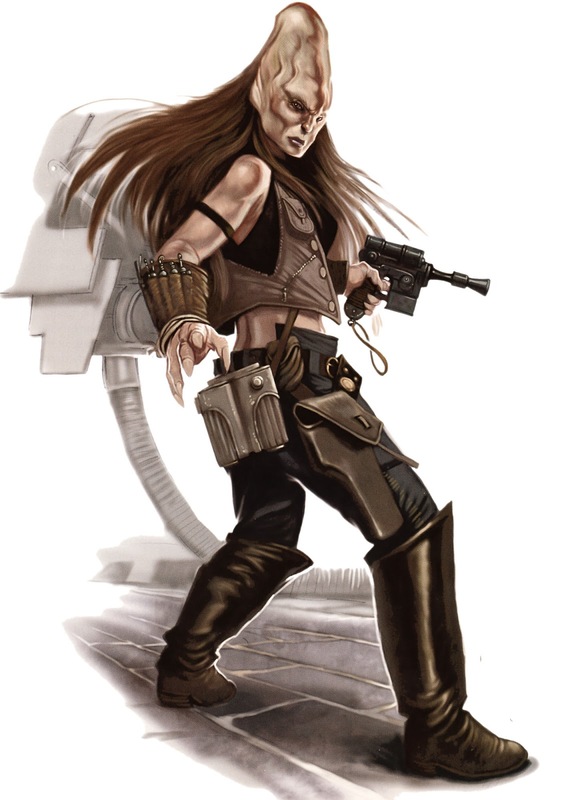 I liked the Force powers from SWGA enough that when I revised the Jedi/Sith class I kept the SWGA Force system and powers but allow the Jedi/Sith to gain more Force points per level. First up is character class basics. All classes are tracked with the same experience and use the same attack base to hit and saving throw track. Saving Throw: 15 at 1st level; min of. If you must use multiple saving throw categories all classes use the Fighter saves. The racial and class modifiers will apply to these as well. Attacks and Saves based on total character level. Class attack bonuses do not. 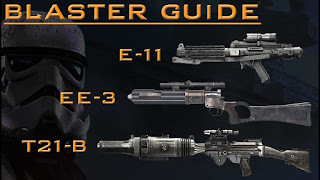 A Jedi/Soldier character does not get a stacked +2 with a lightsaber. +4 bonus to hit and do x2 damage. This works with ranged attacks until targets know they are in danger. At level 4 the damage is x3, at level 8 it is x4, and at 12 it is x5. This can come about from carefully planned surprise, Sneak checks, etc. If the character is well hidden the DM may decide to forgo a check at all. Use common sense. The more the character sets up advantages the better the odds of backstabbing. Anyone can attempt a backstab but the bonus to hit is a +2 in stead of +4 and the damage modifier is x2. Bounty Hunters receive a +1 bonus to Fast Draw initiative every three levels and receives no -2 penalty to their attacks for drawing and using a weapon in the same round. Normal fast draw rules: character declares they are pulling a weapon. -3 penalty to iniative, -2 penalty to hit if they use it in the same round it is pulled. 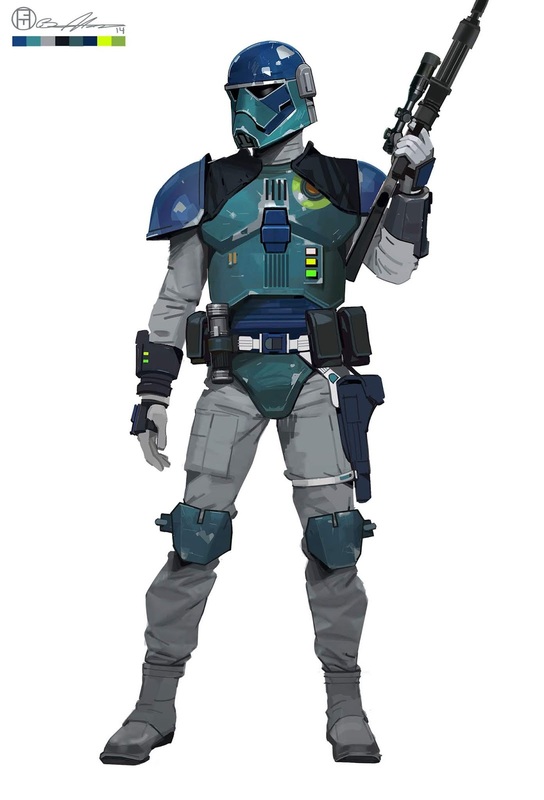 As a Bounty Hunter gains levels his rep and confidence grows. The Bounty Hunter can make a Strength or Charisma check with his bonuses vs a target's opposed Wisdom check. 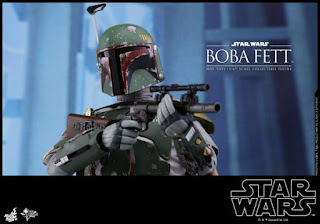 If the Bounty Hunter wins the target is intimidated and is at -2 to all combat, saves, and abilty roles for a number of rounds equal to the Bounty Hunter's level/HD x2. 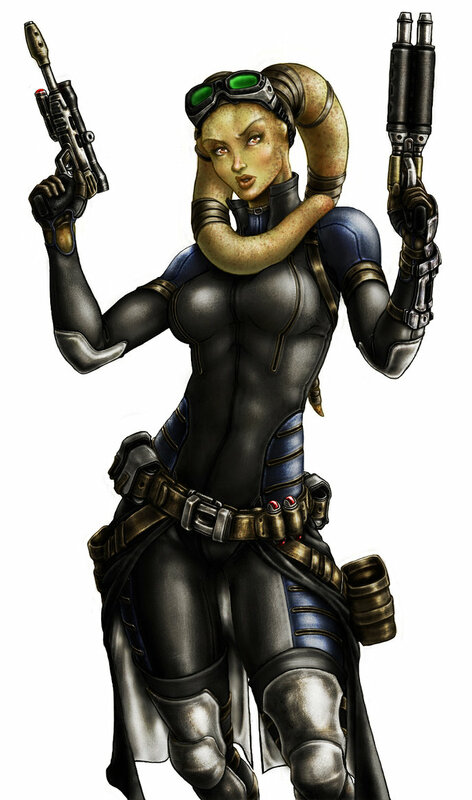 If the target wins the Bounty Hunter must wait 24 hours to try to intimidate the target again. Int, +1 per two levels. 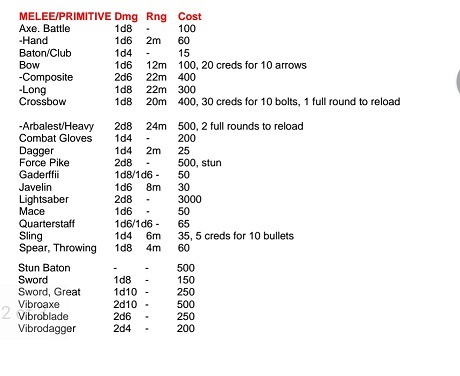 When trying to find a target the Bounty Hunter can make this roll once per day per three levels. Success leads him to a person or clue to help him on the trail to find the bounty. This is in addition to normal role-playing on the Player's part. With a Lightsaber in his possession the Jedi can do the following. 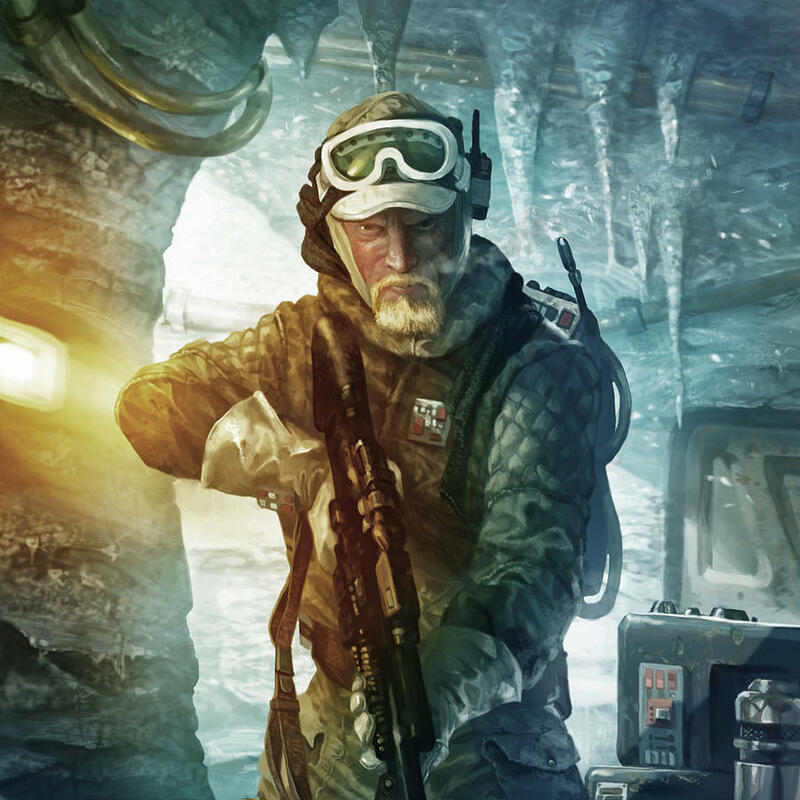 The Jedi can draw, ignite, and use the lightsaber in the same round with no penalty to initiative or attack. 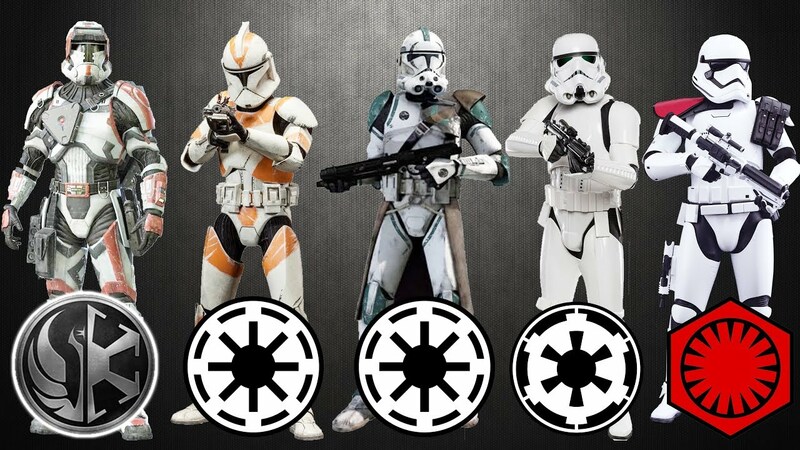 AC bonus equal to one half Jedi Level rounded up in light or nor armor. IF in medium armor this bonus is halved again. Deflect: No attack is allowed this round. The Jedi gains a x2 AC bonus to his current Lightsaber bonus. Follow Through: The Jedi can gain possible extra attacks with his lightsaber at levels 3 and 12. He must make a successful attack to take the extra(s).If the first strike hits he can take the second. If he has a third attack available he can attempt that attack if the first and second both hit. 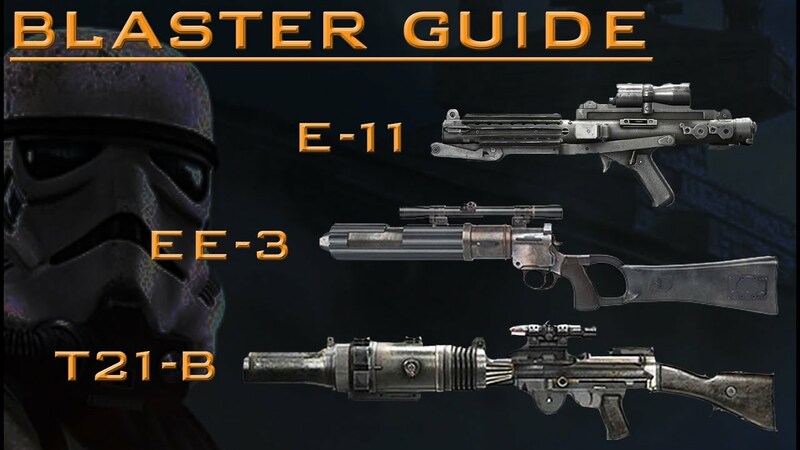 Re-Direct: (Gained at level 3): Only usable on personal or speeder scale weapons. No attack is allowed this round by the Jedi. 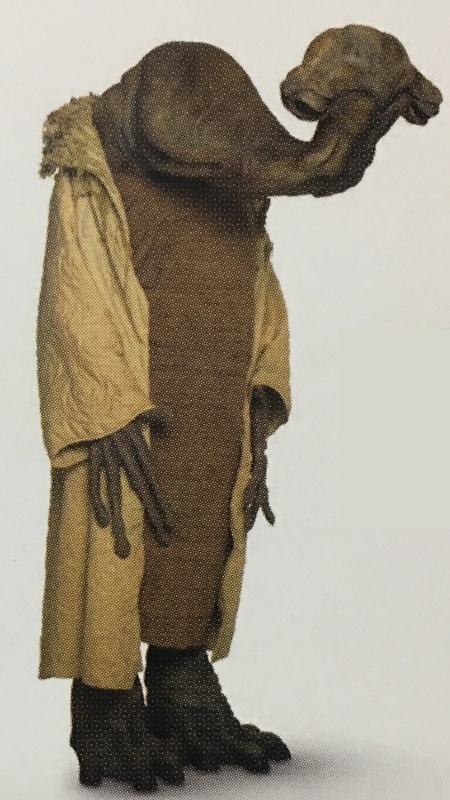 If a ranged energy attack (aimed at the Jedi or an ally within five feet) is missed by five or less the Jedi can make a ranged attack (with the +1 lightsaber hit bonus) and send the energy attack at a target of his choosing. He may do this with all ranged energy attacks in his area for the round. Each deflected attack by the Jedi is at a -1 penalty after the first. 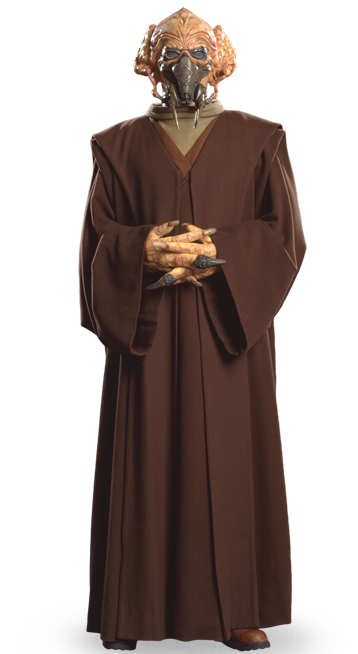 Trained Force Powers: The Jedi can learn a number of powers equal to his level plus his Wisdom bonus. 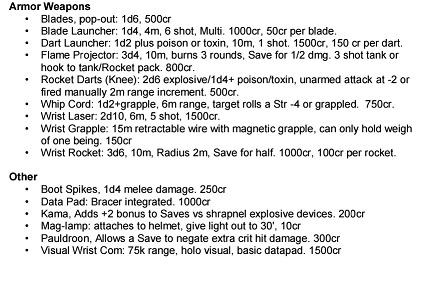 These are considered trained and he can use them normally at normal cost. 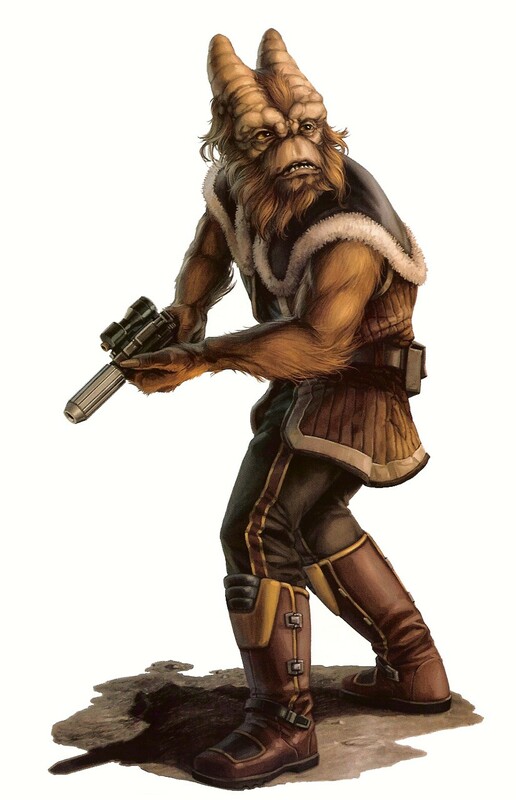 Untrained Force Powers: These powers can be attempted but it requires a Wisdom check with a penalty equal to the FP cost of the power. IF successful the power works but costs x2 the normal FP cost. If failed the power is failed and the x2 FP cost is paid anyway. The Medic can use his knowledge of anatomy to target key damage points on the body. This gives him the Backstab ability of +4 to hit, x2 damage if the target is unaware of the attack. The Medic can make a Diagnose check to diagnose the illness of a patient, giving him information on proper treatment of the illness and a bonus on any further checks with that patient. The DM can modify this with a penalty based on insidious or obsucure conditions. Bonuses for success are: +1 hp when rolling a 1d6 on Healing and a +2 on Stabilization checks. IF the Medic has no bacta or medpac or kit, he may attempt to heal 1d6 hit points of damage to himself or another with basic first aid. The healing attempt must be rolled each time it is used. He can attempt the healing check until successful but each subsequent check has a cumulative 2 penalty to the roll. If assisted by another Medic the check has a 2 bonus. If another Medic takes over he also has the accumulated penalties due to failures of the first medic. A natural 20 failure results in 1d4 hp damage. Within 24 hours, before natural healing begins, bacta/med can be used or another Medic with a higher First Aid score can attempt to heal the wound again. Bacta will always heal more. Healed hit points replace the original First Aid total if a higher number is rolled. If he succeeds on the First Aid check he will roll 1d6 and compare it to the original roll. If it is greater the new hit point roll replaces the original roll. 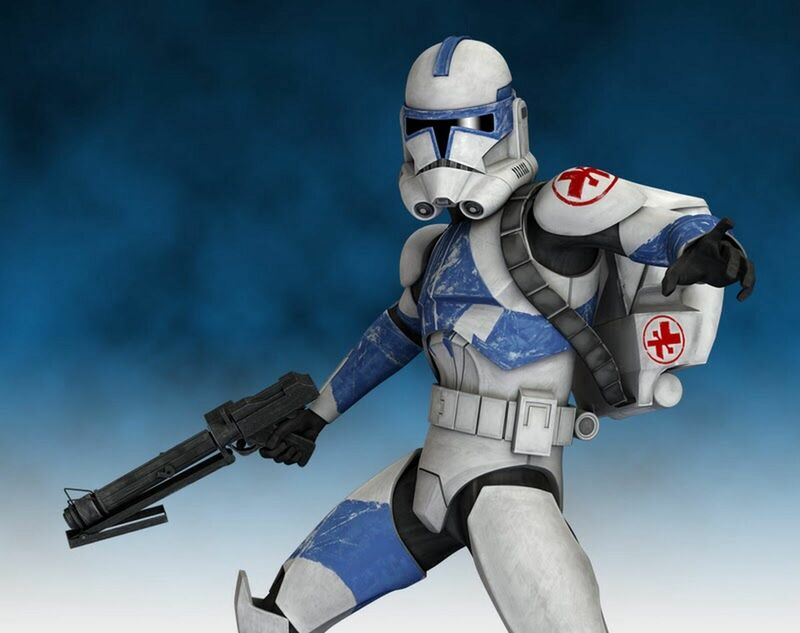 If he rolls less it is ignored and the original Medic's healing stands as is. The only way the patient will lose hit points this way is if the new Medic rolls a natural 20 failure on the healing check. If that occurs he loses 1d4 hp. If a character is wounded again The Medic can attempt bacta/med or First Aid to a new set of wounds, but no matter how good the healing rolls, unless bacta is used) it will not heal the patient of more hit points than were lost in the new set of wounds. For example: A Soldier has lost ten hit points in a fight. The Medic makes a successful healing check and rolls to heal five hit points. Within 24 hours another Medic of higher skill can attempt a better healing. Later that day the Soldier is damaged again for three more points of damage. The Medic makes his healing check and can heal these three points of damage if he rolls well enough, but no more as he cannot attempt to heal the previous wound's lost hit points a second time. A Medic can try to control bleeding, apply CPR, etc to attempt to stabilize any character that has reached 0 or fewer hits point, and would otherwise be dead or dying. The Medic must reach the victim within a number of rounds equal to the Medic's level beginning on the round after the patient drops to 0 or below. Once the Medic has reached the patient he must then make a check with a -1 penalty to his score for every hit point below 0. If he succeeds in this the character is stabilized and does not continue to lose hp. He cannot regain more hit points from first aid or medpacs at this point. Only bacta or healing naturally will work. If the victim is wounded again, another Stabilization can be made but with a +4 penalty in addition to normal bonuses and penalties, representing the shock of additional wounds to the body. 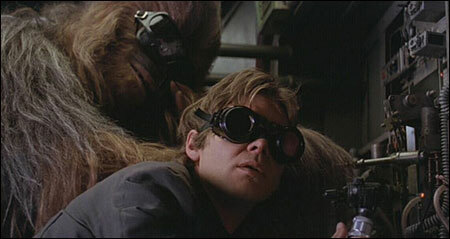 Firing from a vehicle and starship or with vehicle or starship mounted weapons the Pilot receives a +2 bonus to hit. 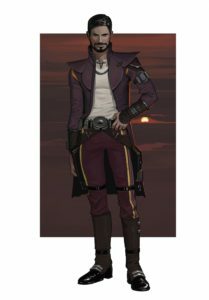 With a bit of conversation, the Scoundrel is able to attempt to befriend, persuade, charm, or outright con an NPC to his way of thinking. After 2d6 rounds of cajoling, flattering, drinking, etc. the victim of the Fast Talk must make a Wisdom check opposing the Scoundrel's Charisma with fast talk bonuses. +1 to Fast Draw initiative every three levels and receives no -2 penalty to their attacks for drawing and using a weapon in the same round. -1 to be surprised. Adds +1 every three levels to Wisdom/Notice checks. +4 to hit, x2 damage, works with ranged attack until targets know they are in danger. The Soldier is better at avoiding damaging due to dodging, blocking, parrying, etc. The Soldier can gain possible extra attacks at levels 3 and 12. He must make a successful attack to take the extra(s).If the first strike hits he can take the second. If he has a third attack available he can attempt that attack if the first and second both hit. As he gains skill and reputation the Spy meets a lot of others in the crime business. With a successful Charisma check the Spy may ask one favor of a criminal or underworld contact such as a bribe-able official or officer, drug dealer, gangster, smuggler, etc. The favor will be things not generally available to the average citizen, usually information or perhaps a use of a special talent. The contact will not endanger himself or his employment and will usually negotiate a payment or favor in return if the favor is difficult or unpleasant. The Spy may call upon these contacts twice per adventure at first level. 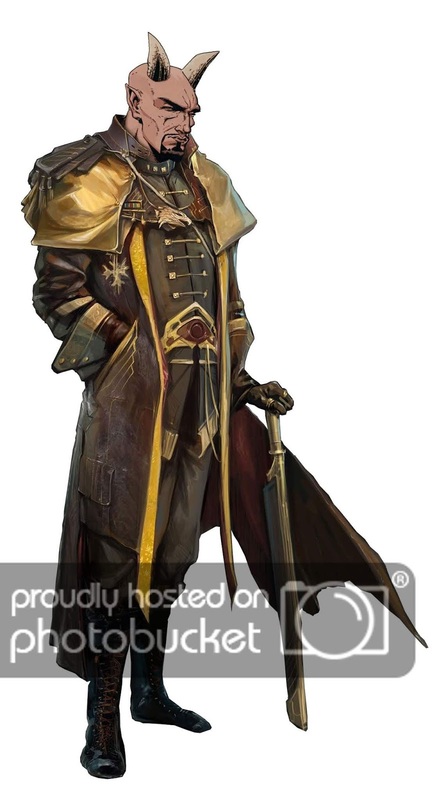 He may add an extra time for each bonus to his Charisma check due to higher levels. 1-3 at first level, 1-4 at fifth level, 1-5 at 12th level. Must concentrate for a full round to listen. +4 bonus to rolls to Computer, Navigation, or Repair as appropriate. To succeed on a check roll the appropriate Attribute score or less. Class abilities give a bonus to the Attribute score. Natural skills have no penalty. Class skills can be attempted by classes without the skill but at a -4 penalty to the score. Remember: bonuses to Skill checks add to the Ability score. Penalties subtract from the score. Once the score is totaled then the dice are rolled trying to meet or roll under the score. 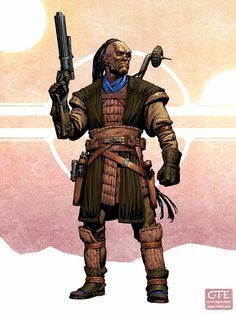 A Bounty Hunter, level 7, has a Dex of 12. His piloting Ability is +1 per three levels giving him a +1 bonus for levels 1 - 3 and +1 for levels 4 – 6 and a +1 for level 7 for a total of +3. His unmodified piloting checks are now at 12+3 = 15 or less on a d20. A non-pilot class would have a -4 to their roll. Sometimes characters will try Ability or Skill rolls in opposition. Pilot vs Pilot, Computer vs Computer, Sneak vs Wisdom, etc. The characters total their scores, roll, and whomever makes the roll by the most wins. If they succeed with the same amount it is a tie. The character may have the option of taking 5 to 20 times (20 is the maximum) the time necesary to make an Ability/Skill check to gain a bonus to his score. At 5 times the bonus is +2, at 10 times the bonus is a +4, 15 times is +6 and 20 times is +8 to the score. This can help offset penalties to the score, especially non-skilled penalties. Intimidate: making someone fear or be wary of you. Endurance:during a chase, on a forced march, etc. General knowledge of the universe: Alien species, ships, etc. Search: visual detector/eyes. Includes both looking for something purposefully and spotting something you were not actively looking for. Persuade: charm, force of personality to persuade. Unlike natural skills, anyone can attempt a class skill check. If they do not have levels in a class that has the class skill there is a -4 penalty to this roll in addition to any ease/difficulty modifiers. Includes programming and attempting to get secure information. Also includes bypassing electronic security systems: alarms, locks, camera systems, automatic weaponry, etc. The character must have access to an access panel or be hooked into the system to override it. Complicated systems may impose a penalty. Success bypasses or shuts down the targeted system. Opposed Charisma checks plus or minus bonuses. The player with the best roll wins. Ties are pushed into a second opposed roll between those who tied. Sleight check for a +2 bonus to the Gambling check. If the cheater fails his roll by five or more the other players can make a Wisdom check opposed by the cheater's Sleight to spot the fumbled attempt. If the cheater rolls a natural 20, he has been spotted by his victim or victims. 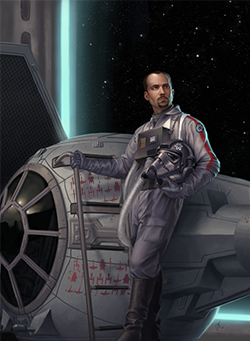 Pilots add their bonus to any required Dex driving a vehicle or flying a ship. This ability also negates the -4 penalties non-pilots receive. He also adds his Pilot bonus to the vehicle's AC. Using and fixing electronic devices such as computers, droids, vehicles, ships, etc. The fixer must have parts, take the time set by the DM, and make a successful check. Simple Repair (everyday item, simple weapon) no penalty, 1/5 cost. Moderate Repair (tech weaponry, mechanical/electronic component), -4, 1/5 cost. 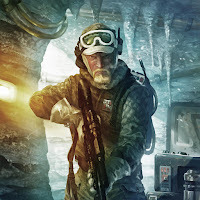 Complex (droid, lightsaber, vehicle, computer) -8, 1/5 cost. Very Complex (Starship component) -12, 1/10 cost. Simple repairs take minutes, more in-depth repairs take hour or even days. Vehicles and starships have repair rules in their sections. Anything involving manipulation of small objects: picking pockets, palming weapons or cards, picking mechanical locks. You can use this skill to attempt to cheat at Gambling. Moving silently or concealing yourself. You must be un-detected before you attempt this skill. 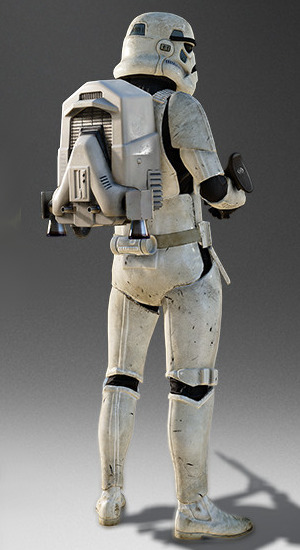 Can be used to sneak up to melee backstab, hide in a locker before a stormtrooper enters a room, etc. You can move at half move and still attempt to Sneak. If there is a chance to hear the sneaker it may be opposed with a Wisdom check. Survival in natural environment. Finding food, water, making shelter, tracking, not getting lost and any other requirement. You can guide others and attempt to find adequate food, water, and shelter for the others as well. The character rolls in addition to normal foraging/getting lost rolls. Penalties can be incurred for weather and other factors against the character. I have a lot prepared and just need to put up. Will be working things up for several upcoming posts. Bear with me. Armor, Weapons, and modification rules for both. 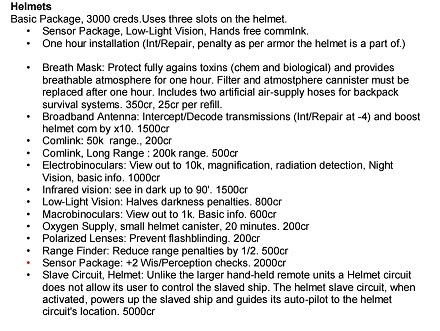 A large list of equipment and prices.